This topic contains 0 replies, has 1 voice, and was last updated by ADDIE 1 year, 7 months ago. 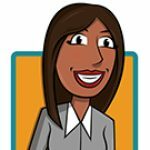 I am an instructional designer who feels very comfortable with just about all of the various parts of my job: working with faculty to develop high-quality online courses, staying on top of new developments in the field of online instruction, conducting research, and contributing to the discipline of instructional design by presenting at conferences. I love what I do. Still, there is one important area where, I admit, I feel less than confident: implementation of the Americans with Disabilities Act (ADA). I am familiar with the basics of the ADA and support the expansion of educational opportunities to all students, including those with disabilities. I help faculty with all of the routine stuff (e.g., image alt tags, scripting/captioning videos, etc.). But I have limited personal experience working with people with disabilities and am concerned that I lack insight into what it’s like to be a student with a disability. I want to do more than just the minimum, do more than tick the box that says courses are ADA compliant. Do you have any suggestions that could help me? Courses or class materials posted online must be in an accessible format. Videos (online and in-class) should have closed captioning to ensure that people with hearing loss can effectively understand the information. Materials such as class handouts or readings must be accessible by screen readers commonly used by people with vision loss. Physical handouts passed out in class should also be made available in accessible electronic or alternative formats (ADA National Network). But, as you rightly asked, is this all there is to it? How can we, as instructional designers and faculty developers, create educational courses (online and onsite) that address the needs of all of our students in a way that sees the ADA as a starting point rather than an ending point? 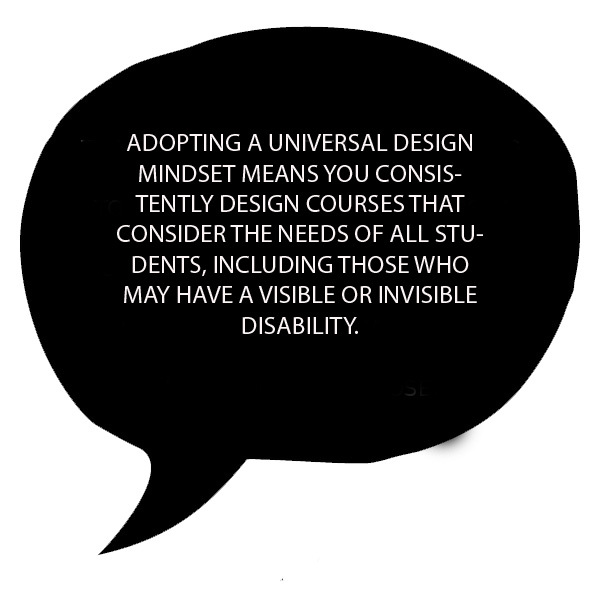 A deep-seated commitment to creating inclusive courses (online and onsite) involves breaking down the distinction between students who have disabilities and students who do not in favor of universal design principles that address the needs of all students. For example, closed captions that benefit students who may be hearing impaired can also benefit students who, while not hearing impaired, may simply prefer to see the closed captions in place of, or in addition to, listening to the audio component of a video. Placing a priority on extending instructional options (e.g., closed captions, alt text) and considerations (e.g., high contrast text, limiting videos to 3 to 10 minutes in length) to all students challenges our binary view of our audience (disabled and able-bodied) that creates the need to manage two sets of learners. Adopting a universal design mindset means you consistently design courses that consider the needs of all students, including those who may have a visible or invisible disability. Fortunately, the growth of interest in ADA-compliant, inclusive course design means that resources in support of this goal are increasing, too. For example, a recent article in Inside Higher Ed—5 Tips for ADA-Compliant Inclusive Design—offers suggestions for using hyperlinks, text design, images/graphics, audio/video items, and documents. Also, the TOPkit website provides resources for addressing accessibility during faculty development, including links to the California State University’s Accessible Technology Initiative and Florida State University’s Universal Design/Accessibility page. TOPkit’s Sample Course and Sample Course Light contain lots of good information on UDL principles as well as inclusive instructional strategies and best practices. Overall, the world has become a better, more inclusive place for persons with visible disabilities as well for those whose disabilities are less visible but still constitute barriers to educational opportunities. A commitment to inclusivity in education has emerged alongside a revolution in distance teaching and learning—and therein lies our challenge going forward. How will future advancements in online education address the needs of all students and what can we do to ensure that these advancements serve all students and contribute to their success? And how do we, as instructional designers and faculty developers, remain vigilant in keeping the focus of new technologies on how these technologies can serve all students? In closing, I want to ask the TOPkit community: what are your feelings and experiences regarding designing instruction for persons with disabilities? How do you fulfill the ethical imperative to develop and promote inclusive instruction?